The first two published reviews of The Rosewood Massacre: An Archaeology and History of Intersectional Violence are now availalbe. Both are complimentary. The first is published by Michael P. Roller in Historical Archaeology. Here is a link to the review. The second is by Al Hester in The Public Historian. Here is a link to the review and the PDF version. Project director Edward Gonzalez-Tennant spoke with NPR’s Here & Now about ongoing efforts to purchase properties in Rosewood and convert them into a historical museum and commemorative space. You can listen to the interview below, which starts are 25:50. 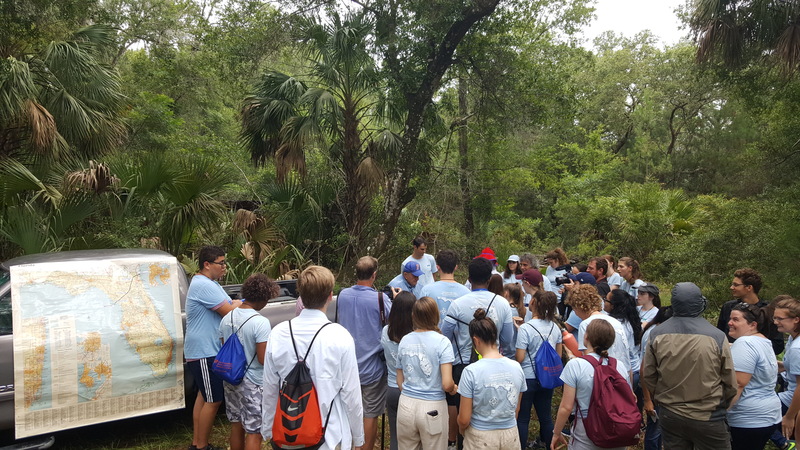 For the second year in a row Dr. Edward Gonzalez-Tennant joined the Humanities and the Sunshine State program from the University of Florida to guide students on a tour of the African American cemetery in Rosewood. This excellent program brings together high school students from around the state of Florida to consider the humanities as a major and career option. The image below shows students interacting with the cemetery’s current property owner, Col. Robert “Bob” Whitener. The excitement seen on some of the participants faces relates to a surprise Col. Whitener has for them, authentic pieces of red cedar (aka “rosewood”) from which the town received its name in the 1800s. The current owner of the J.M. Wright house has decided to sell the property, and a renewed interest in Rosewood has emerged. Dr. Edward Gonzalez-Tennant has repeatedly suggested a park/memorial be installed at the site. He was recently quoted in the Gainesville Sun and Tampa Bay Times regarding his work. A number of public talks have been scheduled following the publication of The Rosewood Massacre. It was fitting that the first public talk take place at the Cedar Key Public Library. Citizens of Cedar Key and surrounding places have been big supporters of our research. Part of the talk discussed future work planned for Rosewood and Sumner, which begins in 2018. January marked the culmination of a decade of research into Rosewood’s past with the publication of The Rosewood Massacre: An Archaeology and History of Intersectional Violence by the University Press of Florida. You can order the book online here. The Virtual Rosewood Research project was recently featured on a five-minute spot run on WFSU public radio. Based in Tallahassee, WFSU Public Media provides quality public broadcasting services to north Florida and southern Georgia. It is both an NPR and PBS station based at Florida State University. You can listen to the spot here. The Virtual Rosewood Project was featured at the Rosewood: The Road to Reparations event co-organized by the Southern Legal Council and Three Rivers Legal Services in Gainesville, Florida. The event featured two guest speakers, Dr. Maxine Jones and Stephen F. Hanlon. Dr. Jones served as PI for the 1993 report on the destruction of Rosewood while Hanlon represented the survivors and descendants of Rosewood in the landmark 1994 Florida Legislature decision which ultimately awarded $2.1 million to his claimants. An updated Rosewood virtual world was unveiled and attendees were able to explore it with laptops, VR goggles, and various handheld devices. Dr. Edward Gonzalez-Tennant delivered a lecture regarding the current state of research in Rosewood for the St. Augustine Archaeological Association. This talk, titled Digital Archaeology and Difficult Heritage: New Research in Rosewood, Florida took place at Flagler College and reflected on nearly a decade of research into the use of digital technologies to document, interpret, and share the story of Rosewood, Florida with modern audiences. Dr. Edward Gonzalez-Tennant delivered a lecture for the citizens of Levy County regarding his ongoing work in Rosewood. The talk took place at the Cedar Key Library to a packed audience. In addition to sharing research about Rosewood, this event allowed us to generate renewed interest in our work and connect with new collaborators. Dr. Edward Gonzalez-Tennant organized an oral history workshop at the Cedar Key library. While not focused on Rosewood, such events allow us to integrate our findings within local and regional histories of Levy County. The workshop led to an agreement between Dr. Gonzalez-Tennant and the Cedar Key Historical Society (CKHS) to digitize 30 oral histories. The last week of August marked the inaugural fieldwork of a new collaborative project exploring Rosewood’s past. The Rosewood Heritage Project is the next phase of the work Dr. Edward Gonzalez-Tennant began with his dissertation. Visitors to the site can now experience a completly reconstructed, virtual version of Rosewood as it existed prior to the 1923 race riot.The layout of the community is based upon the spatial template created by mapping historic property (HP) ownership. The present version was completed between June 2010 and June 2011. In all, the virtual reconstruction took about 600 hours to complete. This does not include the several months in late 2009 and early 2010 spent researching the historic properties. A group of historians collected fourteen oral histories as part of the compensation bill which made its way through the Florida state legislature in 1993 and 1994. Few people have access to these oral histories because the transcriptions were only published in a limited number of volumes. A small number of these volumes exist in various libraries around Florida, until now. Weather has profound effects on our everyday actions. Numerous survivors of Rosewood report how the winter of 1923 was one of the coldest on record. Can daily weather observations from the area around Rosewood shed light on the 1923 Rosewood race riot as well as the experiences of those who survived it? Visit the weather data page for more info. Various datasets used during the Virtual Rosewood Research Project (VRRP) are currently being placed online. These will include census records, oral histories, business directory entries, maps, weather data, and various documents. Visit the data portion of the website to learn more. The St. Pete Times recently ran a story by Jon Wilson, writer and researcher with the Florida Humanities Council’s quarterly magazine Forum. His article was featured on the front page of the Perspectives Section. You can view a scanned version of the article here. Mark Scohier of the Chiefland Citizen recently discussed the Virtual Rosewood Research Project in early January. The article was reprinted a few days later in the Cedar Key Beacon as well. Thanks to Mark for the coverage and attention it has brought to the project. You can read the full text of the story here. The Rosewood historical marker was dedicated in 2004 (click for text), and has been repeatedly vandalized ever since. This typically takes the form of unknown persons wrapping a chain around the sign or its support post and violently dragging the sign away. The sign is typically recovered within a few weeks in one of the many swampy areas surrounding Rosewood. The marker was once again vandalized by unknown persons in October, 2010. Dr. Edward Gonzalez-Tennant learned about this from an area resident, and documented the area the morning of October 7, 2010.